Submitted by Migrate Wizard on 2016-09-06 18:05. This portrait is derived from the Assassin set by Phaere. This is how I imagine Vico from A Dance with Rogues by Valine. 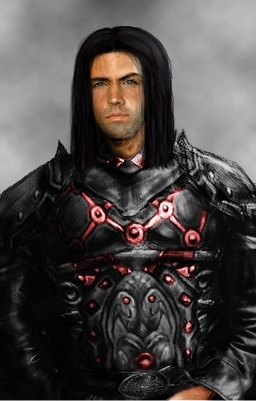 I've recolored the armor and the eyes, given him a little facial hair, painted on a new hair style using brushes by Para Vine on DeviantART, and given him an overall darker look. Considering that this was my first attempt at painting hair, I'm pretty pleased with the result, although I'm open to suggestions on how to make it look better. The only part I'm not pleased with right now is his right eye. It looks a little dead compared to his left which I added a shine to. I've tried applying a shine to the other one but it just looks wrong no matter where I put it. I'd be very happy if someone could help me solve this problem. I'm considering making a series of portraits for this module if there's a demand for it. I've already begun collecting stock images for Pia and Norah. If you like this, please rate and comment. I especially want to read any constructive criticism you may have since I'm still learning and will continue to make improvements as I become more adept at photoshop and digital painting.